This lively urban streetscape filled with traffic signs, flashing lights, and welcoming graphics signals hello and welcomes families to Crosstown. Families congregate within the large public arena, with its soaring spaces and decorative trusses, to talk and play together. Balloon-like globes ignite the sky, chandeliers provide a sense of spirituality and warmth while gothic-inspired benches provide places for conversation. Children inherently understand that the activity closet that beckons with spinning wheels, gears, and fun-house mirrors instructs them to store their coats and gear. The center of the Village Green is public space, more serene than the corridor. The focal point is a small pavilion, reminiscent of the image of a traditional church. The pavilion doubles as a movable stage for an orator or performer and is a modest play structure. 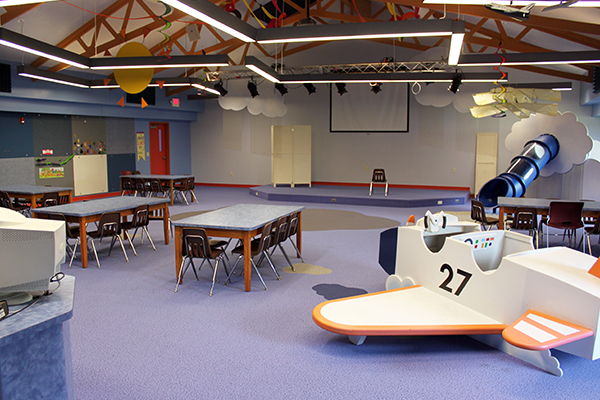 This calming environment readies children to allow their parents to go on to the service while they follow the clear signage and stepping-stones (islands, clouds, paw prints, and lines) which lead children to their individual classrooms. Children arrive at their themed classrooms that share modularity and an efficient flexibility of design. 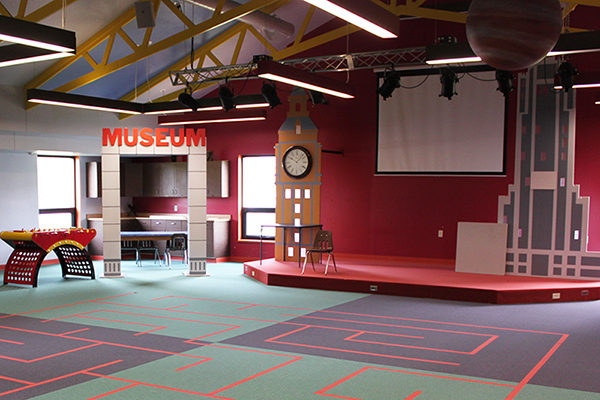 Each themed classroom follows a consistent layout with a central stage, an open space, and nooks for art and reading. Instructional Walls, panels of dry-erase, magnetic, and pin board surfaces, allow teachers varying methods of communicating current objectives, parables, and examples. ME-Zones display and celebrate children’s creations using picture rails, shadowboxes and cork surfaces. Children and adult volunteers work either in large groups for drama or in small groups for discussion, activity, and prayer. Developmentally, emotionally, and spiritually, opportunities have been created at Crosstown to present imagery that relates to Biblical stories and which encourages appropriate role-play and exploration. 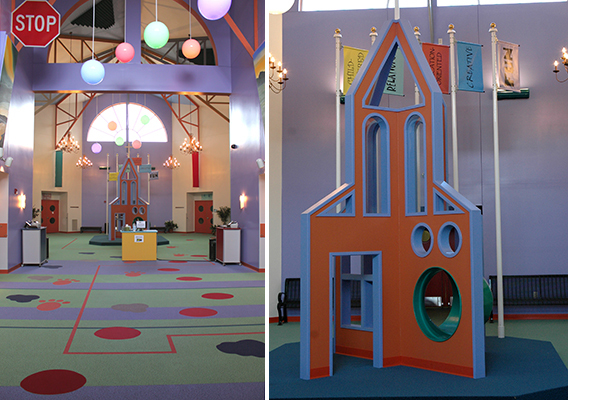 Architecture, Interiors, & Exhibit Design: Architecture Is Fun, Inc.